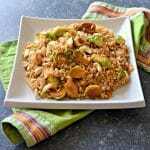 A simple, super speedy & delicious meal which brings together fresh, sweet brussels sprouts, nutty brown rice & buttery cashew nuts in a delicious tamari, maple sauce. Heat a large skillet over a medium heat and add the oil. When hot add the brussels sprouts and sauté until just tender (about 4 minutes). Add the onions and garlic and cook for another few minutes until the onion is just beginning to turn a golden brown. Add the tamari and maple syrup and stir well to coat the vegetables. Add the rice and cashew nuts and continue cooking for another couple of minutes or until the rice is piping hot.